Mammoth Mistake is the first book in a new series by author Alex Miles, who, among other things, has written for the hugely successful ‘Zac Power’ series. 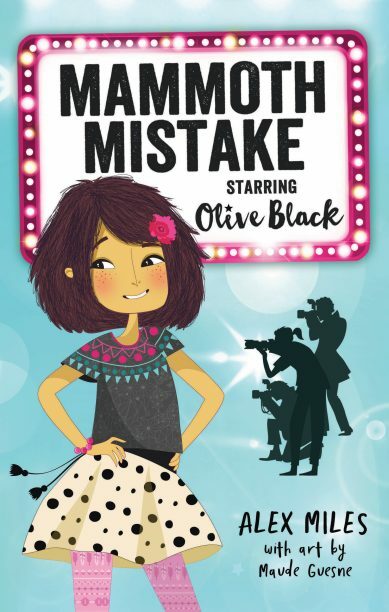 Olive Black is a fairly average girl, for a movie star. She might attend the premiere of her new movie Mammoth Mistake wearing the latest designer gown, but she cares more about her friends than the spotlight. Which is why, when her best friend Rani gets mad at Olive for abandoning her, she knows she has to go off-script and speak from the heart to win her back. Mammoth Mistake is a week in the life of a film star. Its charm comes from its central character Olive, who makes plenty of mistakes and gets caught up in petty jealousy with her rival, but who would do anything to make her friends happy. If the first book is anything to go by, this series will be a big hit with younger readers who enjoy the quirky mayhem of books such as Jen Storer’s ‘Truly Tan’ series. Readers will love Olive, who is feisty, flawed and down to earth. Her adventures will resonate with upper primary students in the midst of their own friendship changes and the chaos of school and family.